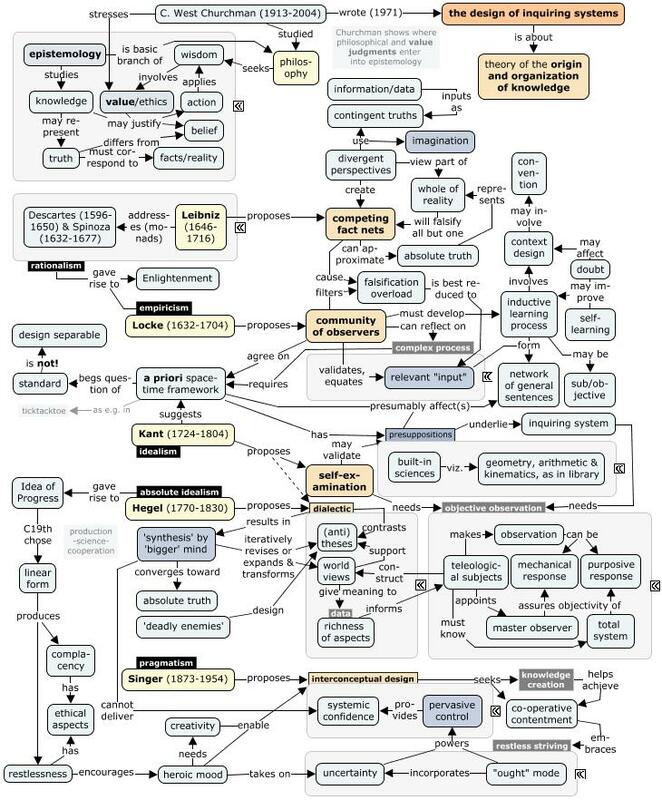 Churchman (1971, p. 17-18) suggests that “.. we can regard the history of epistemology [..] as a description of how learning can be designed and how the design can be justified. This way of reading [..] requires a translation from one philosophical aim to another.” He proceeds by stating “.. where this historical journey will lead. It will suggest some very rich and exciting designs, each design in some sense encompassing the best features of its predecessors. But in the end it will conclude that we are faced today with some critical design problems we do not know how to solve.” Churchman continues to emphasize that science is of little use, since it “cannot discuss social change (implementation) in any but a very restricted sense. Finally, and perhaps most important, science has no adequate way of studying the elusive.” Churchman’s survey of historical designs encompasses Leibniz (1646-1716; rationalism), Locke (1632-1704; empiricism), Kant (1724-1804; idealism), Hegel (1770-1830; absolute idealism) and Singer (1873-1954; pragmatism). Those of you not familiar with philosophy should note that it is not unusual to construct a novel philosophical scheme in this way. It may sound difficult, and indeed the original Churchman’s survey is a long (120 p.) and hard read (or was to me). I hope to have simplified it using a rather elaborate concept map (at the end) without losing the essence, but showing the overall ‘architecture’ instead. Epistemology Philosophy is the quest for wisdom. Wisdom may be considered “thought combined with a concern for ethics” (Churchman 1982, p. 7). Epistemology is the fundamental branch of philosophy that studies (-ology) knowledge (-episteme), more especially its nature, presuppositions, foundations, extent and validity. In other words: epistemology is thinking about thinking. A key question is: what are the conditions for justifying our belief that something is true, if anything? Epistemology is important because our beliefs underpin our actions and we want our actions to be meaningful in some way, and embody our values, even if they are destructive. The design of inquiring systems … is an indirect way of looking at the production of wisdom. It is thoroughly epistemological in the sense that it is about the justification of ways for learning wisdom. Any method for learning wisdom must be based in a theory of the origin and organization of knowledge. It is only by applying the principles of such a theory that we can hope to acquire or generate some degree of wisdom. This may at first look awfully theoretical, but it can be practical if: (1) these principles can be learned and applied; and (2) the results of the application can play a basic role in decision making, whether in business, government or our own lives. N.B. : the principles are loosely derived from the core (pp. 42-205) of The Design of Inquiring Systems, in which Churchman discusses the inquiring systems of Leibniz, Locke, Kant, Hegel, and Singer resspectively. Leibniz (1646-1716) … is a rationalist. Rationalists claim that we can gain our concepts and knowledge independently of sense experience. The problem with sense experience is that it can be deceptive, e.g. when we are dreaming. Leibniz builds on earlier insights of Descartes and Spinoza to design his own pathway to secure knowledge. His monads (or “inquiring systems” according to Churchman) use contingent truths and imagination to create ever expanding competing fact nets. These competing fact nets represent different parts or aspects of the whole of reality. The confrontation will falsify all but one fact net, which is at that moment the best approximation of the absolute truth about reality available. Leibniz is not in the least concerned about origin of the contingent truths, whether they are real or imagined. The fact net competition will sort it out. Principle 1: Reality is best represented as networks of inter-relationships between contingent information. Locke (1632-1704) … is an empiricist. Empiricists claim that sense experience is the ultimate source of all our concepts and knowledge. Empiricism and rationalism were foundational for the Enlightenment, which means they changed the course of the history of mankind in the most significant way imaginable. According to Israel (2001), it was Spinoza’s work that gave the big push, although Locke is usually given most of the credit as the source of modern liberal political theory. The problem with Leibnizian theories is that there is no limit to the number and expansion of fact nets. This could easily lead to a problem of “falsification overload”. Locke proposes a filter by a community of observers to validate relevant “input”. This is a complex process of observation, communication and debate involving the design of an inductive learning system that can be improved by self-learning and doubt, including doubt about the presuppositions of the system context. Principle 2: Learning about reality necessarily involves complex social processes. Kant (1724-1804) … is an idealist, both in a philosophical and in the modern sense. However, there is no general agreement about what Kant meant by his idealism (or in fact “transcendental idealism”), so we’ll leave that question open. Churchman argues that Kant identified a flaw in Locke’s empiricism in the sense that for a “community of observers” to agree on some “input”, it will necessarily have to presuppose an ‘a priori’ space-time framework or else it will be difficult to know what input anybody is talking about: without the ‘when’ and ‘where’ it is impossible to identify the ‘what’. Observers can discover this ‘a priori’ framework in themselves by critical self-examination. According to Kant the framework consists of three ‘built-in’ sciences: geometry, arithmetic and kinematics. Principle 3: The underlying assumptions that predispose us to certain perceptions must be recognized. Another well-known idea of Kant is the so-called categorical imperative, of which the first formulation states that one ought to “act only according to that maxim whereby one can at the same time will that it should become a universal law without contradiction.” The categorical imperative will reappear as the “ought” mode in the paragraph on Singer below. Hegel (1770-1804) … is an absolute idealist. Again, the meaning of absolute idealism is a bit obscure, but that doesn´t mean Hegel doesn´t make any sense. In Churchman´s interpretation, Hegel figured that humans need a way of making objective observations that are untroubled by Kant´s ‘a priori’ presuppositions. Now, humans are teleological beings, i.e. most of what they do has a purpose. As a result, these teleological subjects make observations of two kinds: (1) observations in the form of a more or less mechanical response; and (2) observations in the form of a purposive response. The objectivity of observations of the first kind may be assured by some kind of expert or master observer. However, the objectivity of such an objective observer would also need some form of assurance and so on, ad infinitum. At some point the teleological subject must decide who the master observer will be, for better or for worse. The objectivity of the second kind can only be insured by the system as a whole. That´s no simple matter either, since it is practically impossible for the teleological subject to know the total system. As a way out of this conundrum, Hegel proposes a dialectical approach, which combines key ideas of Leibniz, Locke and Kant. In this approach humans give meaning to the richness of information by constructing world views. These world views, in turn, support theses and antitheses, which are contrasted in an ensuing dialect, thus producing a synthesis by ‘a bigger mind’. It is important that these theses and antitheses are constructed as ‘deadly enemies’, i.e. as powerful claims to opposing ‘truths’. The dialectical process is endless as each new synthesis will lead to a new cycle of revision, expansion and transformation of theses, antitheses and underlying worldviews. This process is considered to converge progressively toward the absolute truth. It also fits nicely in a 19th century world view of progress as expressed by mechanization, modernity, Marxism and evolution. Principle 4: A dialectic approach to reality requires iterative redesign of theses and underlying world views. Singer (1873-1954) … is a pragmatist and one of the teachers of Churchman. Pragmatism is the doctrine that practical consequences are fundamental criteria of knowledge and meaning and value, so: a thing or idea is what it does; and, truth is what works. Peirce (1839-1914) – the ‘father’ of pragmatism – writes that he is inclined to “think of him [Alexander Bain, 1818-1903] as the grandfather of pragmatism” when commenting on Bain’s definition of belief, which was “that upon which a man is prepared to act.” In Singer’s mind, Hegel’s ‘bigger mind’ for the production of successive syntheses is unconvincing. Instead of that Singer proposes a form of interconceptual design involving pervasive control seeking knowledge creation to achieve co-operative contentment. This contentment is not static, but rather a balancing act of multiple concepts that embraces restless striving. This restlessness corresponds to the “ought mode” that encourages people to shift into the “heroic mood” and take on uncertainties (about what is right, true or good) in ever new disguises. According to Churchman this “interconceptual design involving pervasive control” should be looked at as taking the form of his “systems approach,” both at a “grand teleology” and practical level. Principle 5: the systems approach is a basic heuristic tool for designing goal-oriented behaviour. Grand teleology …. is the term Churchman uses for the Singerian inquiring system (1971, p. 200). To describe the broad characteristics of this grand teleology Churchman uses the goal-seeking model I described earlier: (1) the inquiring system has the purpose of creating knowledge, which means the capability of choosing the right means for one’s desired ends; (2) the measure of performance is to be defined as the “level” of scientific and educational excellence of all society, a measure yet to be developed; (3) the client is mankind, i.e. all human teleological beings; [we skip 4 and 5 and also 8] (6) the decision makers are everyone; (7) the designers are everyone – in the ideal. Progress [or civilization] can be measured in terms of the degree to which the client, decision maker, and designer are the same; and (9) human action must lead to betterment. This is no easy thing to ensure, so we make explicit the nature of built-in guarantors that give sense to this optimism. In many cases these guarantors will be absent or partial at best. Principle 6: The best intervention design is the one with the best possible interconceptual concordance. The paradox of practical principles Many people will say: oh, these philosophical principles are nice, but are they in any way practical? The surprising answer is: yes, they are, for several reasons: (1) most humans are philosophical animals, juggling values and insights all the time, even when they are not very conscious or explicit about it; (2) when values – in the broadest sense – clash there is a need for a solution, so there is also a need for a well-founded approach. It should come as no surprise that Enlightenment and post-Enlightenment philosophy should provide the necessary neutral inspiration; (3) the systems approach takes into account world views (and biases, values, motivations) as well as hard-nosed decision-making about resource use, environmental factors, negative impacts, expertise, purpose definition, guarantees for effectiveness and implementation, and success measurement. The systems approach is special in the sense that it looks at these criteria for appropriate action in a more comprehensive manner, thus problematizing them in the form of issues: issues of role, issues of central concern and issues of ensurance. By looking wider and deeper, we can see better. Implementation may seem a bit more difficult at first, but the end results will be far less disappointing. 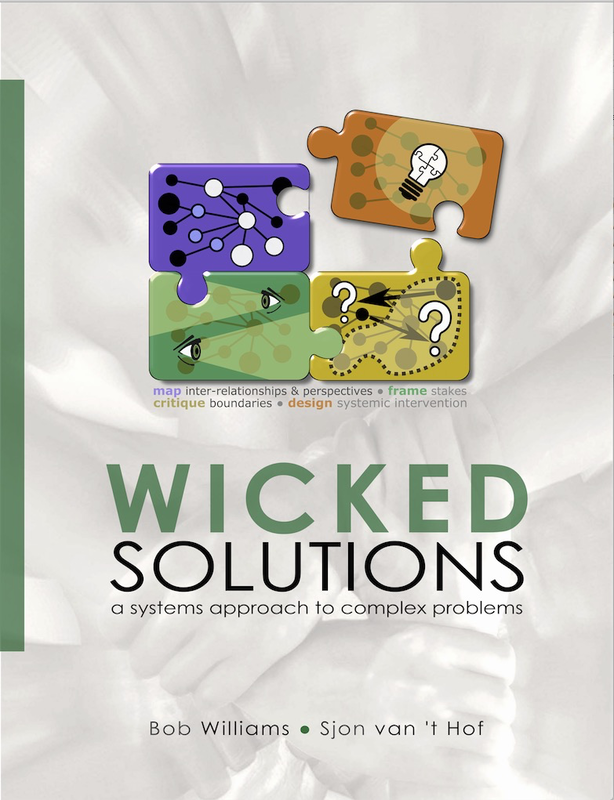 Wicked Solutions … uses a systems approach that incorporates all of the main principles described above. As explained in a previous post, the systems approach in Wicked Solutions is embedded in an induction process using a Leibnizian inquirer according to Churchman. In a way, the systems approach started with Alexander Bain´s statement that belief is “that upon which a man is prepared to act.” Singer showed the need for interconceptual design. Using Singer´s insights, Churchman showed the philosophical necessity of the principles for such interconceptual design and the practical potential of their application. Wicked Solutions shows what a step-wise approach to intervention design based on these principles could look like. Contrary to what you might expect after the explanation in this post, Wicked Solutions is not only easy to learn, but is also highly practical and widely applicable. Inter-relationships, perspectives and boundaries …. are the three systems concepts used in Wicked Solutions to explain what the systems approach is all about. The Leibnizian principle that reality is best represented as networks of inter-relationships clearly corresponds with the first of the three systems concepts. The Lockean principle that validating ideas about reality involves social learning corresponds with systems concept number 2 (see also Churchman’s principles of deception-perception) In fact the Kantian principle that underlying assumptions predispose us to certain perceptions also points to the perspective concept. The concept of boundaries and the associated idea of ‘boundary critique’ corresponds to the Hegelian principle of a dialectical approach to reality. The Singer-Whitehead principles 5 and 6 explain the origins of the heuristic for interconceptual design that is also known as the systems approach in the narrow sense. The astute observer will note that the historical development of these concepts and principles in post-Cartesian western philosophy closely mirrors the historical development of the same concepts and principles in systems thinking (Wicked Solutions, p. 17).